DC Entertainment’s Geoff Johns is the writer of this Wednesday night’s episode of Arrow, and if anyone remembers the episodes of Smallville that he was responsible for, it’s kind of a thing where Geoff Johns episodes are kind of a big deal. Geoff was co-writer of the first Huntress episode earlier this season, but now, we get to see what full-blown Geoff Johns Green Arrow TV looks like. 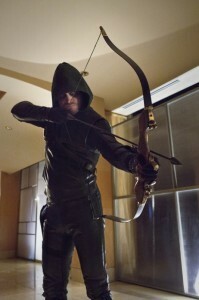 The CW sent this episode out early to the press, which is often a sign that they consider the episode to be a can’t-miss. “Dead To Rights” is, indeed, a big deal, with some character changes and events that will strongly affect the rest of the season leading to the finale. Rather than a full-blown review, here are ten teasers of what we can expect on Wednesday night, February 27. As usual with this sort of article, we don’t want to spoil or ruin anything, but be warned there are some hints inside. 1. Seamless transitions. I don’t know if it is the story, or Glen Winter’s direction, the editors at Arrow, or all of the above, but this episode has some of the most seamless present-day-to-flashback sequences yet. Very clever, and very impressive. 2. Almost everything you expect to happen, doesn’t. Almost everything you don’t expect to happen, does. I had suspicions of what would go down in this episode as soon as promo images for the episode went out — and in almost every case, I was wrong. 3. Someone new learns Oliver’s secret. Entertainment Weekly’s latest print issue gave this away, so it’s not a spoiler to those who had read it… but yes, someone finds out who the Hood really is, and it’s a safe bet that it’s not necessarily who you expect it to be. It also might not be as easily accepted as it was with Diggle or Felicity. 5. For the first time in the history of ever, I’m not excited to see John Barrowman. It’s not that Barrowman is bad at his job — it’s actually that he’s so good! 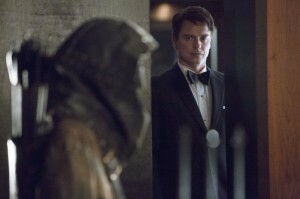 Every time I see Malcolm Merlyn now, a chill of dislike runs down my spine. That’s a sign of a well done villain. Still doesn’t mean I’d be happy to see Malcolm at my doorstep… and I also have to say that anyone who can push Moira Queen as far as Malcolm has is a seriously bad guy. 6. Team Tommy. After a few weeks without as much to do, we learn a bit more about Colin Donnell’s Tommy character and Colin gets a bit more screen time. It’s nice to get to know Oliver’s one-time best friend a bit more. 7. There are disadvantages to dating a cop, even if she is as pretty as Janina Gavankar and as cool as McKenna Hall. Things are going decently for Oliver and McKenna, but you know, if he’s with a cop and he slips away to do his Arrow thing, you just know she won’t be too far behind. 8. There’s a sense of danger. Another sign of good TV or movies is when you get genuinely scared for the characters, and feel a bit of suspense when they’re under siege. Arrow pulls this off REALLY well this week, thanks to the dangerous returns of China White (Kelly Hu) and Deadshot (Michael Rowe), who it turns out isn’t dead after all. 9. Geoff Johns writes Slade Wilson! I ask him a bit about this in the interview that will go up tomorrow, but one of the things I really liked about this episode is that Geoff Johns writes a Slade that reminds me of his older comic book self, who Geoff has also written at times. Everyone so far has done a great job by Slade, who is played really well by Manu Bennett, but it was kind of a treat to see Geoff specifically tackling him. 10. Holy $#!+balls. That’s what Stephen Amell has called this episode on Twitter, and there’s good reason… there are multiple times you’ll either curse, have your jaw drop, or be excited this week. It’s like a mid-season finale with only a few weeks’ break after it. 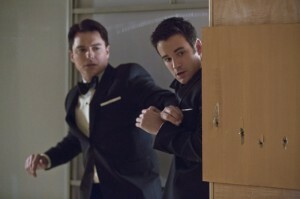 “Dead To Rights” airs Wednesday night, February 27 on The CW. You can find images from the episode here. Stay tuned tomorrow for our interview with Geoff Johns about the episode, and be sure to follow @GreenArrowTV on Twitter for updates!